“Your first look, you see this first impression. It’s not until you really reflect on that that you see a clearer picture,” said Justin Chen, the senior resident on the team. 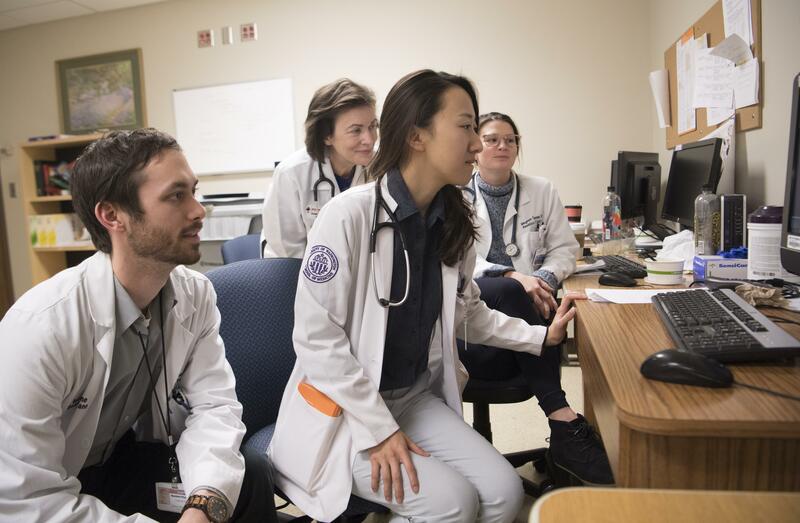 The exercise is part of an effort that began in 2016 to integrate the humanities into the experiences of University of Washington medical students getting clinical training at Providence Sacred Heart Medical Center. Started by Judy Swanson and Darryl Potyk, two internal medicine doctors at Sacred Heart, the hope is to open a team’s time at the hospital with a moment for reflection that connects students and residents to the more human side of medicine. “It really is a wonderful way to move outside of your own perspective,” Swanson said. And it can give student and doctors a way to talk about their own struggles. “They suffer along with the patient,” she said. Swanson’s team, which includes Chen, contemplates a painting or image each morning, with residents and students rotating responsibility for bringing one in. The group goes around in a circle, with each member saying what they notice. Then the person who brought the image in explains why they selected it. Other teams use music or poetry. Annie Yang is the UW student on Swanson’s team. She recently finished the classroom portion of her medical education at the UW Gonzaga campus, and was on her first week of clerkships at Sacred Heart. She said emphasizing compassion has been part of her medical education from the beginning, with exercises requiring students to develop an end-of-life care plan and other humanities discussions woven in. “Part of the challenge of medicine is managing certain emotions and finding outlets for them,” she said. The brief discussions at the start of her days in the hospital fit in with that well. Last year, Swanson had a resident bring in “Landscape with the Fall of Icarus,” a painting by Pieter Bruegel the Elder. It’s a deceptively tranquil image showing a man plowing a hill overlooking a mostly calm sea. But in the lower right corner, you can see Icarus, the Greek mythological figure who tried to escape imprisonment by making wings out of feather and candle wax, then died after the wax melted when he flew too close to the sun. In the painting, he has just fallen to his death. “He said, ‘Here we are, we’re walking by these patient rooms every day and you have no idea the life and death fight that’s going on behind these doors,’ ” Swanson said. The brief discussion – five or 10 minutes – meshes with the hectic pace of rounds in the hospital. Chen stepped out twice to answer phone calls, and Swanson said occasionally they skip the exercise when there are pressing patient care needs. But in a survey of residents and students who participated in the reflections last year, 19 out of 20 said it added value to rounds, and 18 said it was a good use of time. “Many of the songs that we listened to helped illuminate the challenges of addiction and poverty. I try to keep this in mind, particularly when I meet patients whose behavior is challenging,” one participant wrote. The Dali painting was selected by first-year resident Meghan Tanner, who said she thought it showed how the same information can be interpreted so differently by a patient and by their provider. “For me, it’s a reminder that you always have to ask the patient more questions about themselves,” Swanson said.